As I reported in the July issue of The Genre Traveler, the “Back to the Future – The Ride” at Universal Studios Hollywood is going to be transformed into a Simpsons thrill ride due to open in Spring 2008. Therefore, this ride will be closing soon. Yesterday, Universal Studios Hollywood announced that “Back to the Future – The Ride” will close when the park closes on Labor Day, Sept. 3, 2007. Not to say anything bad about the Simpsons — I guffaw each night to the shows re-runs — but I’m really going to miss the Back to the Future ride. I’ve ridden many times, both sober and intoxicated. It is a hoot and a half regardless of your state of inebriation. In fact, this ride was often the reason I would go to the L.A. Dance-a-thon when I lived in the area eight years ago. 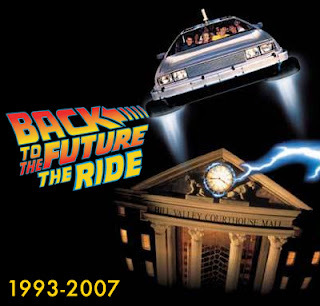 “Back to the Future – The Ride” was introduced in 1993 as a continuation of the Oscar-winning blockbuster Back to the Future film trilogy directed by Robert Zemeckis and executive produced by Steven Spielberg for Universal Pictures. Since that time, more than 61 million visitors have experienced this time-travel adventure ride. To give the ride a proper send off (and, I’m sure, as a ploy to increase summer visitorship), Universal Studios Hollywood is giving people the opportunity to win a 1981 DeLorean. To learn more about winning the DeLorean, visit www.universalstudioshollywood.com or the theme park to register at specially-created Back to the Future kiosks.